I feel like my time is being squeezed on all sides at the moment. I am back in school, so feeling that dreadful “I should really be studying guilt”, I no longer work out before work as my placement starts at 6:30 AM – a bit too early to fit any sort of workout in beforehand, so have been trying to go out for a cycle in the evenings with Mr M, and of course then there is just general life. If someone could hook me up with a few more hours in my day, then that would be just grand. Anyhow, I forget why, but for some reason we were talking about fudge the other day, I think Mr M was talking to his parents via FaceTime, and for some reason it came up – such is the randomness of everyday conversation. 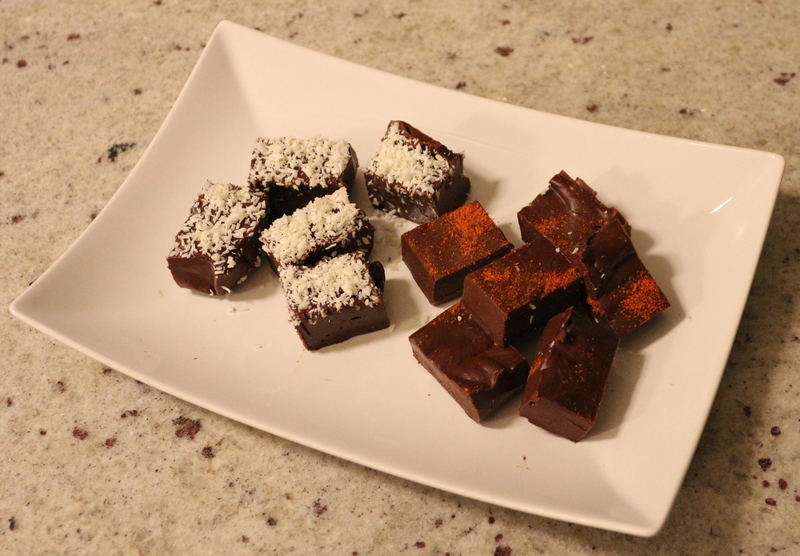 It got us thinking about fudge….. Mmmmmmm fudge! For some reason fudge is not really a super popular thing here. It probably should be, but isn’t, so I decided to make fudge and put ingredients for said fudge on my shopping list before I forgot. Further inspiration came from some spiced double chocolate cookies I made the other week, and memories of a Mexican Chocolate cheesecake I had from The Confectional in Seattle one time….. and having coconut in the cupboard. Here you have it. Pretty much the ultimate in lazy cheat fudge. Cheaty McCheaterson’s Chocolate Fudge Recipe – adapted (for super cheaty-ness) from Sweets Made Simple by Miss Hope and Mr Greenwood. Butter and line a 17cm/7” square tin. Original instructions: Heat 5cm/2” water in a pan. Place a heatproof bowl on top of the pan, making sure that the bottom of the bowl is not touching the water. Add the two types of chocolate, the butter, condensed milk, and vanilla extract/spices (if using) to the bowl. Reduce the heat to the lowest setting and allow the chocolate and butter to melt. Take the pan off the heat and stir all the ingredients together. Cheaty McCheaterson variation: Place all the ingredients in a microwave safe bowl, and microwave on full power until the butter and chocolate have started to go soft – 1-2 minutes. Take out of the microwave and stir together until fully combined. Pour into the prepared tin, add any additional sprinkles (if using) and allow to cool, then chill overnight…. if you can restrain yourself for that long. So there you have it! It quite literally could not be simpler. As gently suggested above in my extra comments, I made a double batch, poured off half and topped with coconut, then added the spices to the rest and sprinkled some extra cayenne on top. Make it plain, or make it fancy and add any extras you want, but DO make it. p.s. I called it Cheaty McCheaterson’s, as that is what I called Mr M one time for using dodgy borderline illegal tactics when playing Uno. He got called Cheaty McBitter once too. He is a sore loser and bad winner. You have been warned.